We want to give a big shout out to our December gift certificate winner Kathleen! 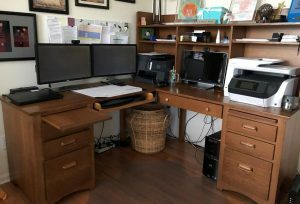 She send us a picture of her Amish Originals home office. We love seeing another happy customer enjoying their Amish Originals furniture in a real-life setting. Stay tuned for future winners! Want a chance to win a $100 gift certificate to Amish Originals Furniture Company? Just post a picture of your Amish Originals Furniture in your home or at your business on our Facebook page or send it to info@amishoriginals.com and be entered in to win!